Ever wondered how your community looked 100 years ago? This feature includes juxtaposing photographs of our region, one from contemporary times and another from a time long past. Overview of the north Union Street bridge over the Boardman River taken from the tower of the Traverse City State bank. Steamer ”Puritan” on the bay, ca. 1910-20. Image courtesy of Traverse Area District Library, Local History Collection. 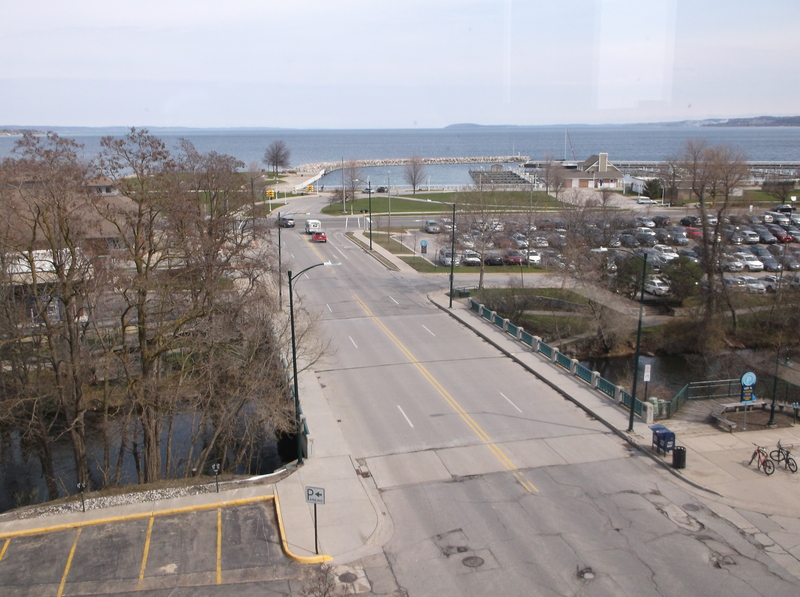 Taken from third floor of the Fifth Third Bank building (formerly, the Traverse City State Bank), two photographs taken more than a hundred years apart tell us about the dramatic changes Traverse City has experienced with regard to its water front. The older picture shows a waterfront dominated by industry and the railroads. The original Morgan canning plant, looking like an A-frame, occupies space at the very end of Union Street. The railroad station stands to the left, tracks running along the Bay in either direction. Ramshackle frame stores line the east side of Union, north of the northern-most bridge over the Boardman River. View from Fifth Third Bank at 102 W Front Street in April 2016, looking north. Image courtesy of the author. The recent picture startles us with its emptiness: no railroad station, no manufacturing plants, no railroad tracks. Open space and parking lots take their places, along with an expressway (Grandview Parkway), and a marina, with slips unoccupied on this early spring day. Suitably, the Visitors Center replaces the train station, a change symbolic of how the Bay has come to be seen. No longer was it regarded as a place to load and unload the stuff of industry. Instead, it became a place to appreciate natural beauty in all four seasons. But the capitulation of space to provide for the needs of automobiles poses a contradiction: Can the noise and fumes of cars coexist with the fragile beauty of the Bay? City residents hold starkly different opinions. Brian Allen, Benzie County Christmas Bird Count 2015 leader, spotting for birds at Green Point Dunes, Lake Michigan. Image courtesy of the author. From the perch on Green Point, a wide expanse of Lake Michigan to the South and West stretches as far as the eye can see. It would seem to be the prime spot for the Christmas Bird Count. But this year there are few birds to be spotted–so few that Brian Allen said that he is going to Peru where there are lots of birds to see. The Christmas Bird Count was started in the year 1900 by Frank Chapman. At the time it was the custom to engage in side hunts, a sort of competition to see who could shoot the most birds; Except for this custom falling to the wayside, little else has changed in how the count is recorded between then and now. Chapman founded Bird Lore, a publication that listed the first Christmas Bird Count (later the Count was moved to the Audubon Magazine). Copies of Bird Lore are available to view and download through the Biodiversity Heritage Library. 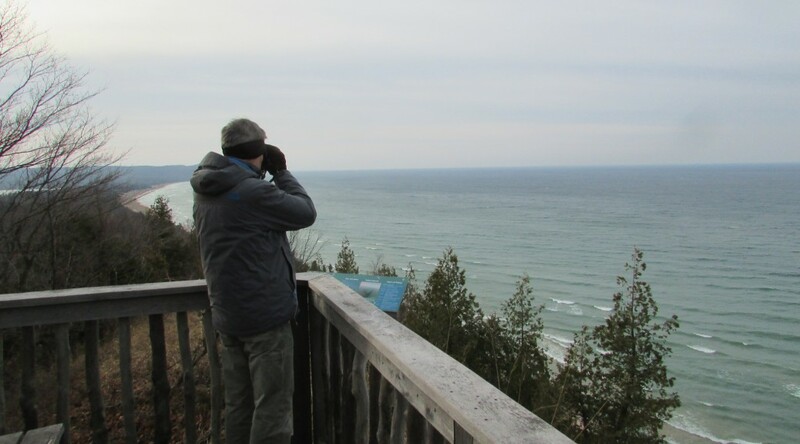 Compiling the Bird Count is Brian Allen, one leader of the Benzie County Count. Image courtesy of the author. The Audubon Society organizes the effort each year to count rather than shoot birds. The results are compiled and published on the Audubon Website. Thousands of groups across the country meet in the field around Christmas to count avian species. There are others who stay at home and keep note of the kinds and numbers of birds they see at their backyard bird feeders. In 2013 there were 71,531 people that participated in the Audubon Christmas Bird count. There were 2,369 locations in the Western Hemisphere. Each location has a compiler. 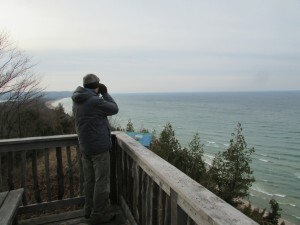 I joined the Benzie Audubon group for the 2015 Christmas Bird Count. 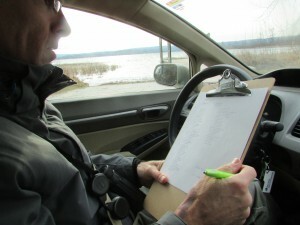 Brian Allen was the leader of one of eight field groups spotting in the Western Region of Benzie County December 21, 2015. As with all the Christmas Bird Count groups across the country we would count all the birds we could spot in a fifteen mile circle. The Benzie Audubon compilers are John Ester & Carl Freeman. 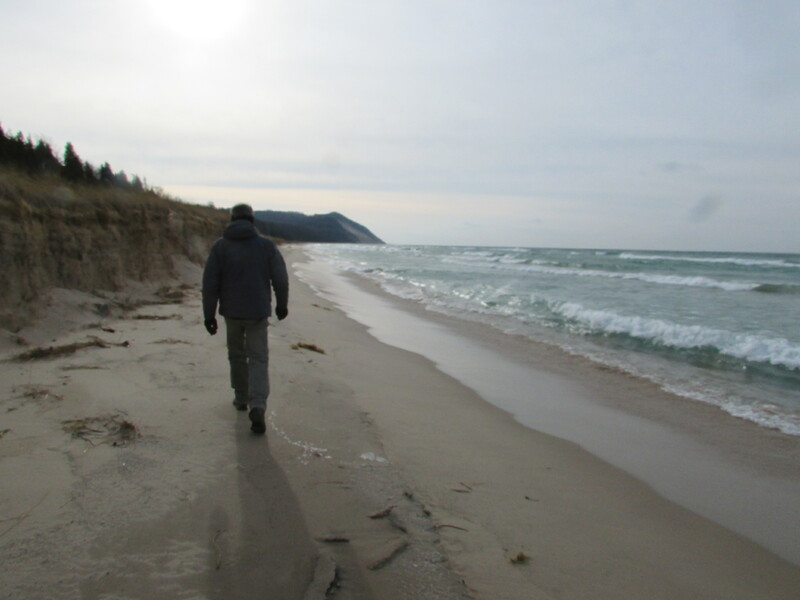 A beautiful day for a bird count; Brian Allen on the shores of Lake Michigan in Benzie County. Image courtesy of the author. Allen and I had a portion of the circle South of Betsy Bay along Lake Michigan. Our area included Upper and Lower Herring Lakes. Armed with binoculars and a clip board we stopped at a number of different locations. The variety of habitats we trekked included beach, woods, stream, field, and lake. Year after year some of the same birds can be seen in each of these habitats. We finished in time to attend the Benzie Audubon potluck where the species were read out loud. Our total was 21 bird species, making the trip to Peru unnecessary. Benzie County Christmas Bird Count 2015 team. Image courtesy of the author. 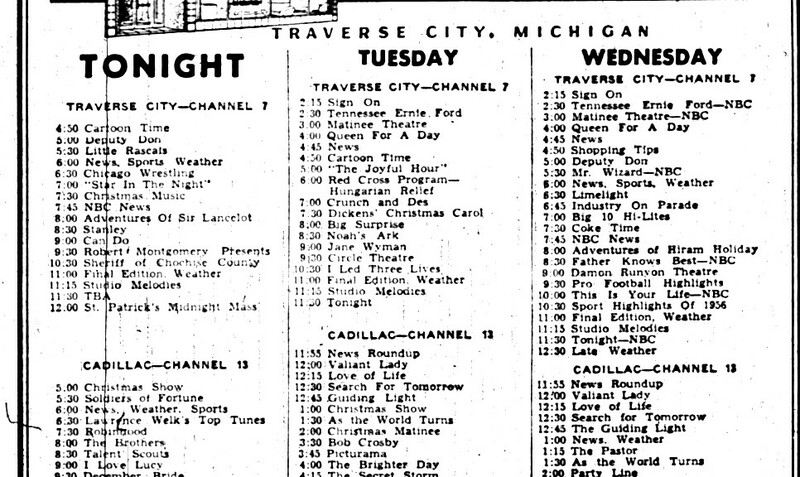 The Grand Traverse Journal presents a schedule from the dawn of the television era. As you study it, consider these questions: What functions besides entertainment did early TV provide? What audiences were most likely played to (men, women, children, persons of different races)? 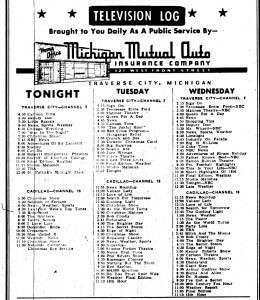 How would today’s TV schedule differ from this one? Send us your reactions. We would love to hear from you. 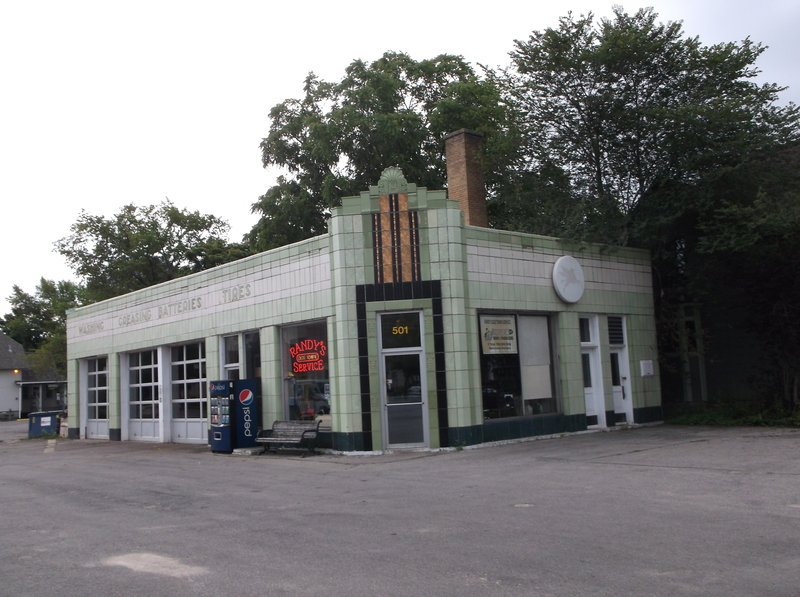 For as long as there have been automobiles, there have been gas stations. At first they were no more than pumps along curbs, but, as oil companies began to compete for market share, they took on a specific character that proclaimed service, style, and branding to the motorist and to the public in general. 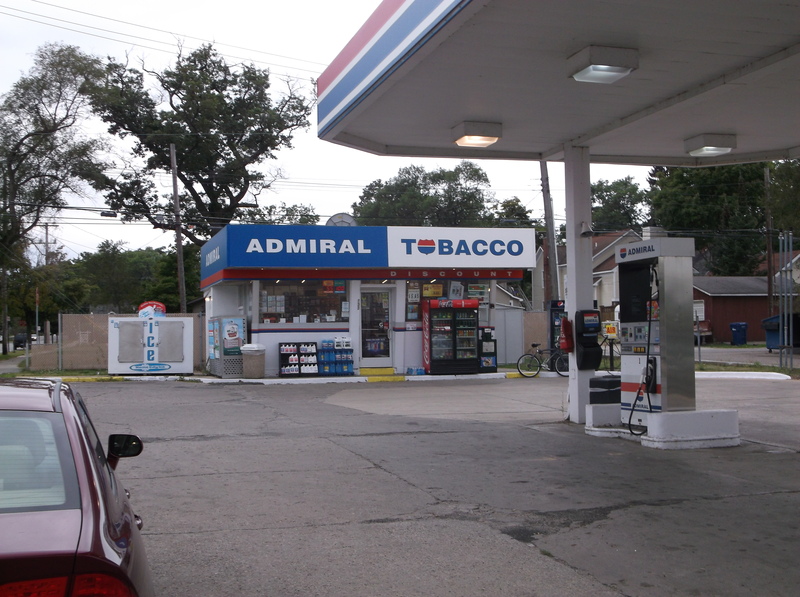 That character was expressed in station design and the way gas stations fit into neighborhoods and communities. Even now, in subtle ways, they communicate a sense of product and place to all people, not just auto owners. 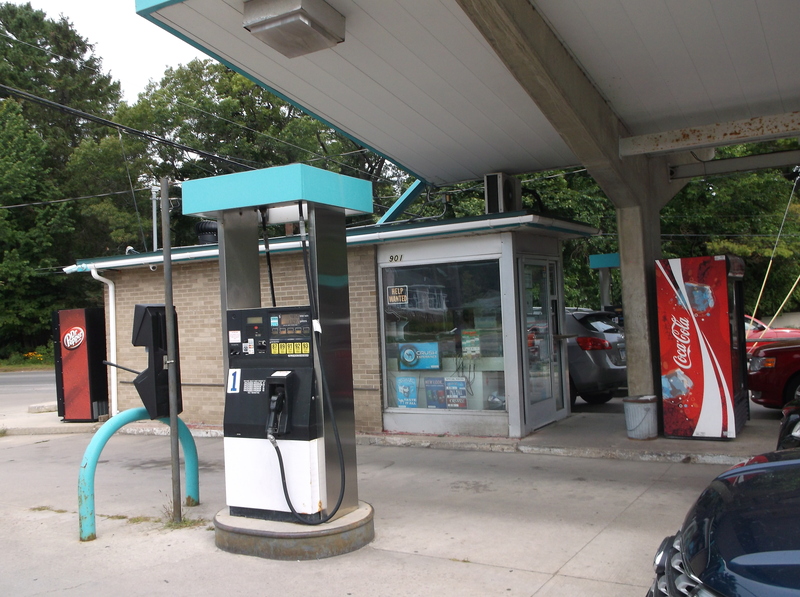 In the Grand Traverse area it is impossible to find curbside gas pumps, since regulations concerning the dispensing of gasoline products forbid them. In the first and second decades of the twentieth century, however, they were common. The picture below showing the “Indian Gasoline” station in Elk Rapids is typical of the curbside design. 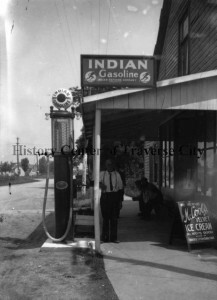 At this early time little effort was expended to mark a gas station as a place designed to fill a specific function: only the branding on the pumps, “Indian Gasoline,” tells us anything about the product. 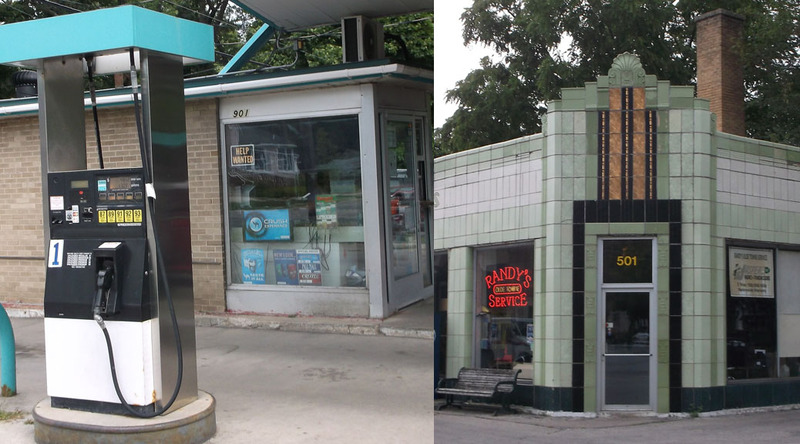 In the 1920’s, gas stations began to take on a new appearance. One new design was the house filling station, one of which still exists in Traverse City as the “Flower Station” on West Front Street. As cars became more prevalent, oil companies sought lots close to residential neighborhoods in order to market their products to homeowners who drove automobiles. Since they had to blend in with nearby homes, such stations frequently sported a steeply inclined roof, windows with individual panes, flower boxes, even chimneys. Such places certainly did not convey the reality of exhaust fumes, the smell of gasoline, and the sounds of automobile engines—all of that would clash with the quiet elegance of nearby homes. 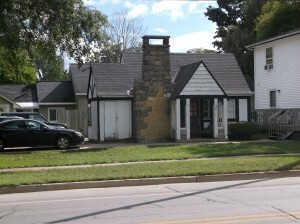 House style filling station, at Front and Wadsworth Streets. Cottage style gas station on Veterans Drive. The next major innovation in gas station design was the oblong box, a rectangular design with individual bays for servicing. During the 1930’s oil companies expanded product lines such as batteries, tires, and other accessories. Crandall’s iconic station at the corner of Union and Eighth Street (now Randy’s Service) clearly labels each of the bays: washing, greasing, batteries, and tires. Its handsome art deco appearance has drawn attention from many architectural preservationists. 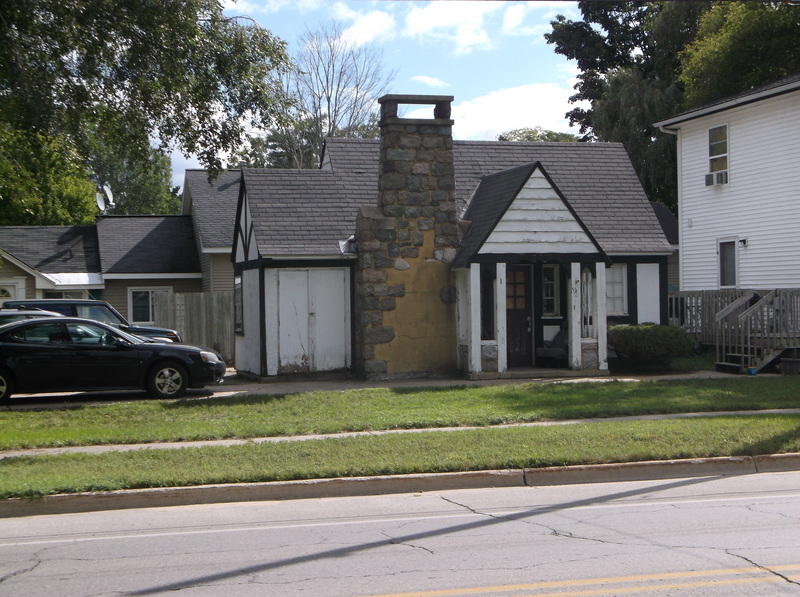 Cliff’s Service on Union Street near 14th across from Speedway is a smaller version of this style. The “oblong box” prevailed from 1940 until 1980 as the dominant design for gas stations. Cliff’s Service on Union and Fourteenth Street. Crandall’s Service on Union and Eighth Street. Beginning about 1970, a new style evolved: the small box. Emphasizing low prices, retailers presented their product in no-nonsense fashion, selling nothing but gas, oil, and a small amount of merchandise aimed at the motoring public. Clark Oil and independents avoided all kinds of promotional gimmicks in order to undercut prices of the major companies, Shell, Mobil, Texaco, Phillips, and the rest. 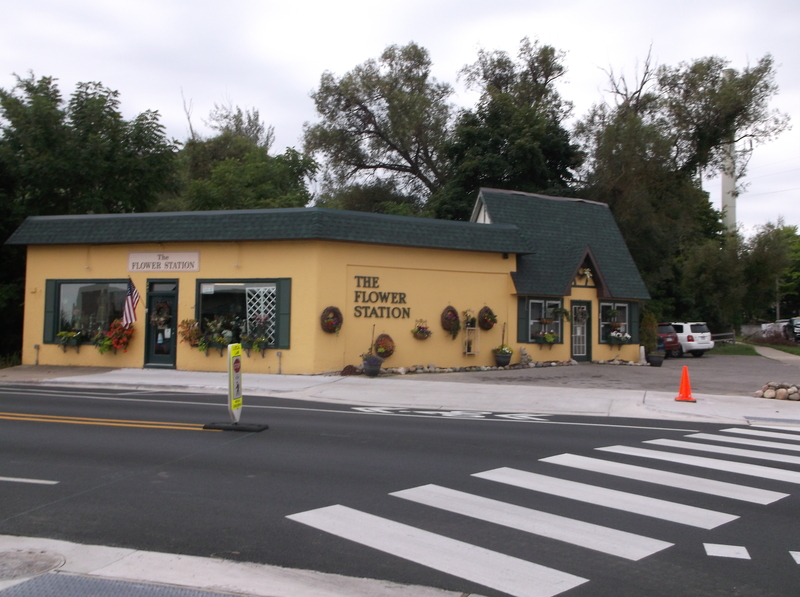 In Traverse City there remain two such stations, one on Division Street and the other on East Front. The latter location is still in operation, though it has added a canopy. 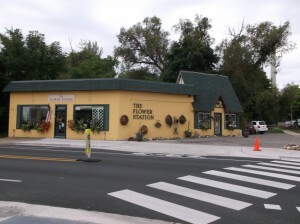 Example of small box style station on East Front Street. About the same time as the small box, the Canopy and Booth design was created—and for the same reason. 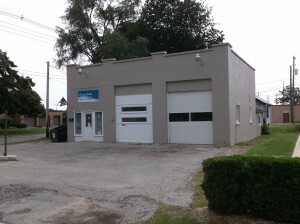 Here, the small box has been reduced to a building no bigger than a highway toll booth. Often a canopy was added to protect customers from the elements. Rest rooms and vending areas occupied small shed-like structures at either end of pump island. In the Traverse area, two of them remain, both active—one on US 31 South, a few miles out of town, and another on East Front west of Garfield Avenue. Toll booth style station, with canopy, East Front Street. 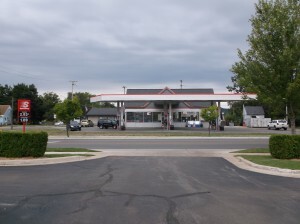 Finally, the most modern incarnation of the gas station is the Convenience Store with Canopy, a design that has become increasingly popular since 1990. Gone is the joining of auto service to the retail purchase of gasoline. In fact, gasoline is only one of many products motorists and shoppers can purchase: cigarettes, fast food, beer, and lottery tickets make up a large percentage of sales, though oil, windshield washer fluid, car washes, and even air for tires are sold, too. Pumps are untended, the consumer required to pump his/her own gas. Convenience store-style gas station, with canopy. How the gas station has changed since the early days! Within the memories of those still living it has morphed from a neighborhood fixture emphasizing personal service to an impersonal store only slightly related to automobile travel. Where before uniformed attendants used to pump gas, check the oil, fill up tires, and maintain automobile systems, now motorists can fill up without even entering the business, paying with a credit card after a few minutes spent at the pump. In such an experience, the human element has been eliminated entirely. The rubber hoses spread on the drive that cheerfully announced the arrival of a new customer with a cheerful “ding,” are forever gone, their absence lamented by those who can remember when getting a fill-up meant more than a simple transaction for gas. Like the neighborhood grocer, the local gas station owner no longer interacts with us, that job being sacrificed in the name of efficiency and lower prices. It has not been a completely satisfactory trade-off. The book most useful in preparing this article was The Gas Station in America, by John A. Jakle and Keith A. Sculle. 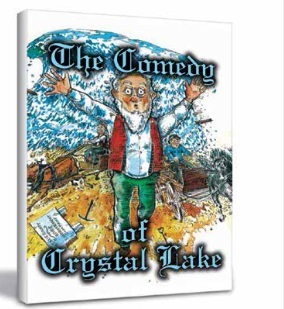 It was obtained by means of interlibrary loan through the Traverse Area District Library. 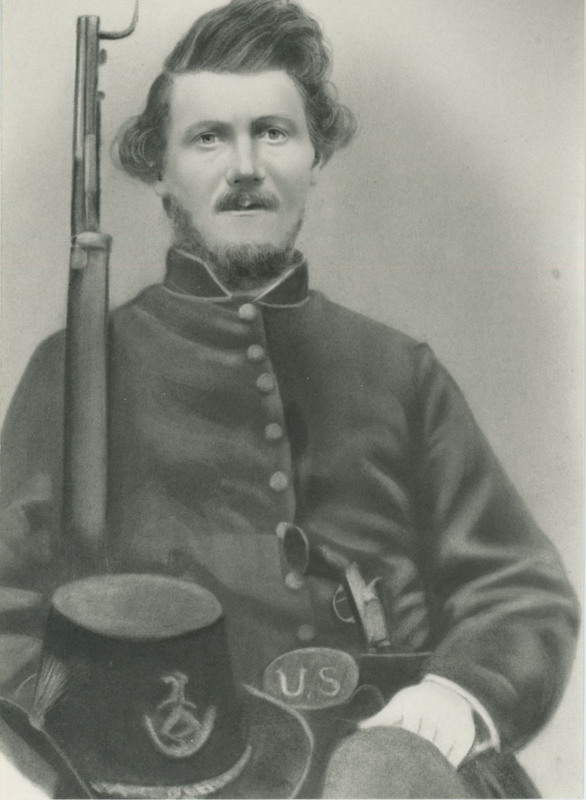 My great-great-grandfather James Gray Brady served in the Michigan Militia supporting Union forces in the Civil War. I have a picture of him and his rifle. I do not possess the firearm in the picture, but I think I know where it is. James Gray Brady of Kalkaska, ca. 1863. After he returned from the Civil War, laws regarding firearms were passed by many different units of government. (There is a twenty page list of gun laws in the book Guns Across America, published in early 2015). The laws concerned many different aspects of the use and ownership of guns. Laws in Michigan prohibited the firing of guns in towns. One such law was passed in 1887. Concealed-carry gun laws were passed in Michigan in 1887, 1891, and 1895. There were additional state laws passed regarding the sale and carry of firearms in 1901 and 1925. In 1931 a Michigan law prohibited the brandishing of firearms. The Uniform Firearms Act, model legislation for states to adopt that established new, restrictive rules on carrying firearms in public, was passed in Michigan and other states in the 1920s. The National Conference of Commissioners on Uniform State Laws recommended that states require licenses for concealed weapons in public. The Commission also recommended that licenses be issued only to a “suitable person” with a “proper reason for carrying a firearm.” Gun sellers were to be licensed and not allowed to sell guns to persons convicted of violent crimes, drug addicts, drunkards, and minors. After the Civil War, many guns used by solders like Grandfather Brady became obsolete and uncared for. In an effort to remove these dangerous weapons from homes, legislation was passed that required individuals to register their guns. Gun owners not wanting to pay to register their guns could turn them in to local authorities. Traverse City Police Chief Blacken had lots of firearms turned in to his office in 1926. There were many Civil War rifles that “would fire when you least expected,” as reported in the Traverse City Record-Eagle on November 6, 1926. Chief Blacken dumped the guns in Grand Traverse Bay, ensuring the public’s safety from dangerous misfires . Many of the rifles and handguns Chief Blacken dumped in the Bay and the Boardman River were turned in by those who did not care to register their firearms; Most dated from the Civil War. 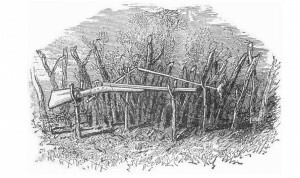 My great-great grandfather James Gray Brady’s rifle may be among the ancient firearms at the bottom of the Bay. Left, James Samuel Brady, son of James Gray Brady; Right, William Wallace Smith, James Samuel’s father-in-law. 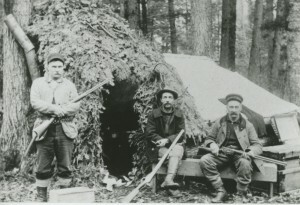 Center, Uncle Willy, at their hunting camp east of Kalkaska, ca. 1900. My great grandfather James Samuel Brady hunted lands in Northern Michigan from his camp “Pokey Huddle”. In a treasured photograph he is pictured with his father-in-law, William Wallace Smith, and Uncle Willy. 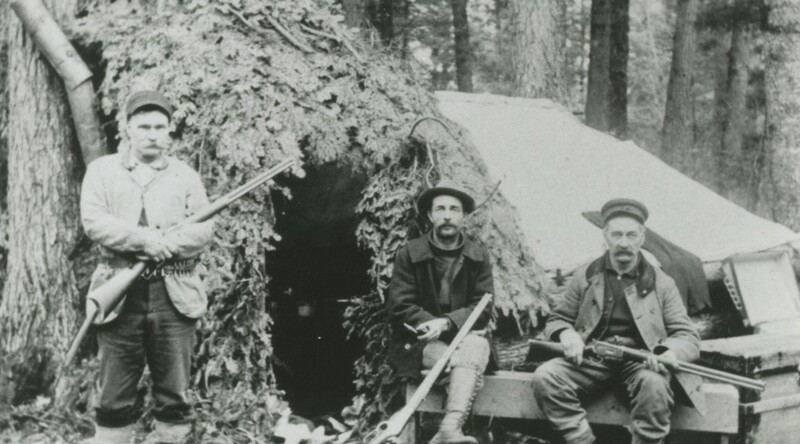 They are all holding rifles and ready to hunt, no different from Northern Michigan hunters of today . 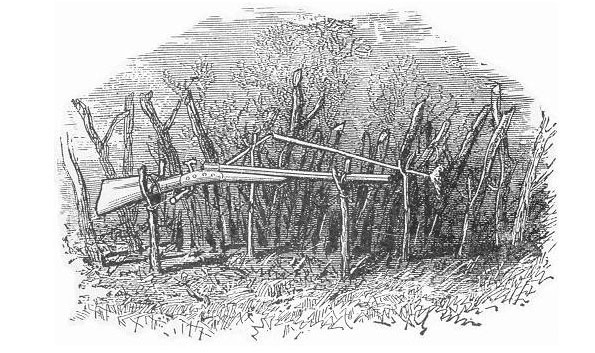 An example of a gun trap, illustration pulled from “Camp Life in the Woods,” by Gibson, published 1881. Laws have changed what, where, and how hunters hunt. Attempting to keep up with new technology, in 1913 the Michigan Legislature passed a law requiring registration of all firearms; in 1927, machine guns with more than sixteen bullets were banned; in 1929, machine guns with silencers were banned; in 1931, gun traps were banned in Michigan. In 1925The American Bar Association Journal published Legislatures and the Pistol Problem, an article that emphasized that the public was against the possession of guns that could be concealed. The police agreed with this opinion at the time. No doubt, Chief Blacken of Traverse City felt that public safety was enhanced by sending large numbers of pistols to the bottom of the Bay. For the same reason, the person–or persons–who dumped the firearm into a hole at the Dougherty home on Old Mission most likely did so to ensure that the firearm would not hurt anyone. The most recent efforts to address gun rights in Michigan are Senate Bills 442 and 561 (October 2015). These bills, if passed, would allow individuals to hide pistols as they walk into Michigan schools, dormitories, and sports stadiums. One of the founders of the National Rifle Association, Karl T. Frederick, “the best shot in America” who won three Olympic gold shooting medals in 1920 at Antwerp, : “I do not believe in the general promiscuous toting of guns. I think it should be sharply restricted and only under license”. We should all consider the wisdom of the Olympian Frederick as new gun regulations are put in place. 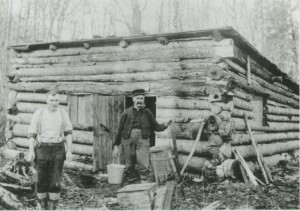 James Samuel Brady and W.W. Smith at the hunting camp they called “Pokey Huddle”, a classic backwoods ‘Tilt’. James Gray Brady would be shocked to know that guns have become an issue of national debate. But, now–as during the Civil War he fought–the firearm death toll is high. The rights sought by one side are non-negotiable: a way of life threatened. While governments seek the power to mediate a settlement between citizens with anything other than a heavy hand, we all look on while tens of thousands suffer gunshot wounds, even to the point of maiming worthy government servants like Gabby Giffords of Arizona. Next time you take a boat ride on Grand Traverse Bay, look down into the water. Who knows?–you might see a cache of ancient firearms somewhere on the bottom where Chief Blacken dumped them. You might even find my great-great grandfather’s rifle. Among all the solutions to the gun problem listed above, I endorse Chief Blacken’s solution as the best. Stewart Allison McFerran is a regular contributor to Grand Traverse Journal. MLive, October 13, 2015 LANSING, MI — A Michigan Senate panel on Tuesday approved gun bills that would allow concealed carry instead of open carry in schools, moving ahead despite concerns from education officials who fear the proposal will do little to shield students from possible violence. Despite a pleasantly warm September, Grand Traverse Journal eagerly reminds its readers that fall approaches. Why ? History Road Trip, of course! 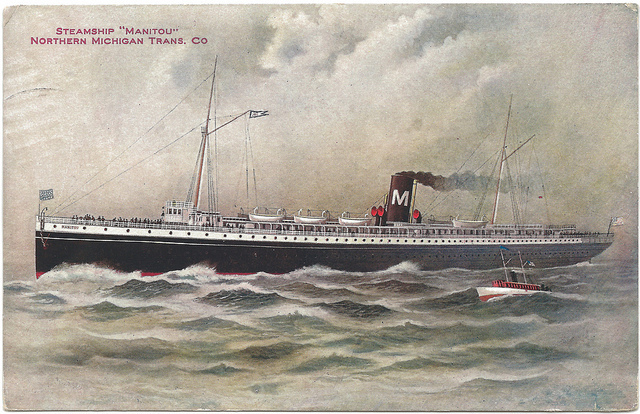 As the weather turned cool, the tourists returned on those same steamers back to Chicago. Until the advent of reliable roads and vehicles, only those who braved Northern Michigan year-round had the pleasure of fall, that beautiful and fleeting season of riotous color. Although we would hardly call the roads “reliable” by today’s standards, the carriage road from Traverse City to Elk Rapids of 1898 was one means of enjoying a ride through fall color. The trip from Traverse City to Elk Rapids may be made by carriage road and will afford a pleasant drive or bicycle ride. The road is, in general, in good condition and for many long stretches very fine. It is somewhat hilly in the central portion, the hills being long but not steep. The distance is eighteen miles and many fine views are to be enjoyed. 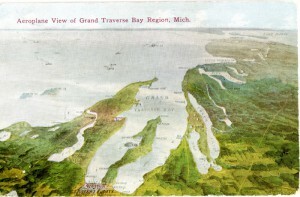 Aerial view of Grand Traverse Region, colored postcard, ca. 1910. Image courtesy of Tom Olds, Traverse Area District Library Local History Collections, http://localhistory.tadl.org/items/show/2115. Crossing the Old Mission peninsula, the road follows along the bay immediately above the railroad, which it crosses at Acme (4 miles). From this point it runs nearly due north, with occasional glimpses of the lake, through a fine farming country passing (about 13 miles) a little lake on the right known as Lake Pto-ba-go (Note: now Petobago Pond, part of the Grand Traverse Regional Land Conservancy). Soon we climb a hill whose crest reveals a fine expanse of lake and shore line. The character of the country from this point begins to show a marked change. Long and beautiful hedges of spruce and fir, wide “openings” adorned with the low, flaring and circular juniper – a shrub or bush of the evergreen family – and exquisite copses of small pines take the place of fields and farms. The road is from this point (for five miles), to Elk Rapids, exceptionally fine and the whole scene is one of wild, romantic beauty and delightful interest to the visitor. (Note: the next 4 paragraphs describe taking the route north by boat through various lakes and rivers; we have edited out that text to maintain the land conveyance). …From Elk Rapids bicyclers may continue the journey to Charlevoix, following due north between Torch Lake and Grand Traverse Bay to the village of Torch Lake (about 13 miles); hence north to the extremity of Torch Lake to Eastport (3 miles); hence due north eight miles, passing the little town of Atwood, five miles from Eastport. From this point the road travels in angular direction northeast, nine miles to Charlevoix. While the journey may be readily made, the road can not be called first class and the bicyclist must be prepared to do some hard riding. Why so far north for a History Road Trip, when you can run up one of the Peninsulas? Prepare yourself for the long-haul past Harbor Springs to the “Tunnel of Trees Scenic Heritage Route,” or M-119. Just north of Little Traverse Bay, this lovely route follows the Lake Michigan shoreline, and the trees are as advertised. Consider it a fall treat from your editors at Grand Traverse Journal! Hilton, George. 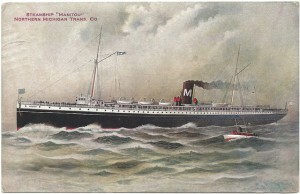 Lake Michigan Passenger Steamers. Stanford, California: Stanford University Press, 2002. Inglis, J.G. 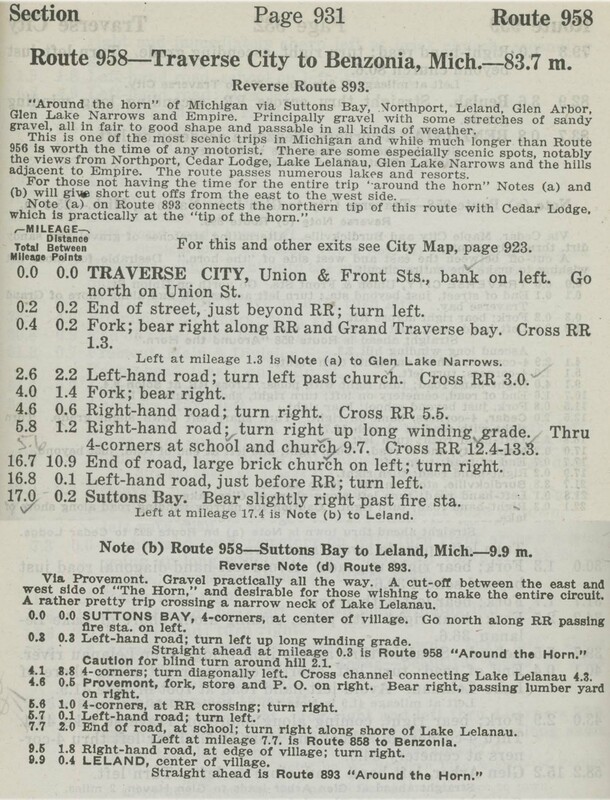 Northern Michigan Handbook for Traveler’s, 1898. Petoskey, Michigan: George Sprang, 1898. Fall color image in header courtesy of Erin Malone, https://flic.kr/p/dhEPqj. Amy Barritt is co-editor of Grand Traverse Journal. There is nothing like weathering a storm to bring people together. After the storm of Sunday, August 2nd, how many complete strangers did you tell about the felled trees in your yard, or where you were standing when the hail started coming down? And, in return, how many of these stories did you listen to? Our “flashbulb memory” of the event may already be fading, but the repetition of sharing our common story certainly helps to hold that experience in our minds, in addition to the records kept in personal diaries and local newspapers. Already, you clever readers are parsing the question apart. What does it mean to be “the worst”? Are we measuring the number of people affected, or the dollar figure attached to the destruction? What type of storms are we comparing, just wind, or does snow and ice count? Who is doing the recording? While this article will attempt to answer some of these questions, unfortunately there are too many variables in the recording methods for weather, as well as in reporting damage by dollar amounts, to be able to provide a definitive answer. 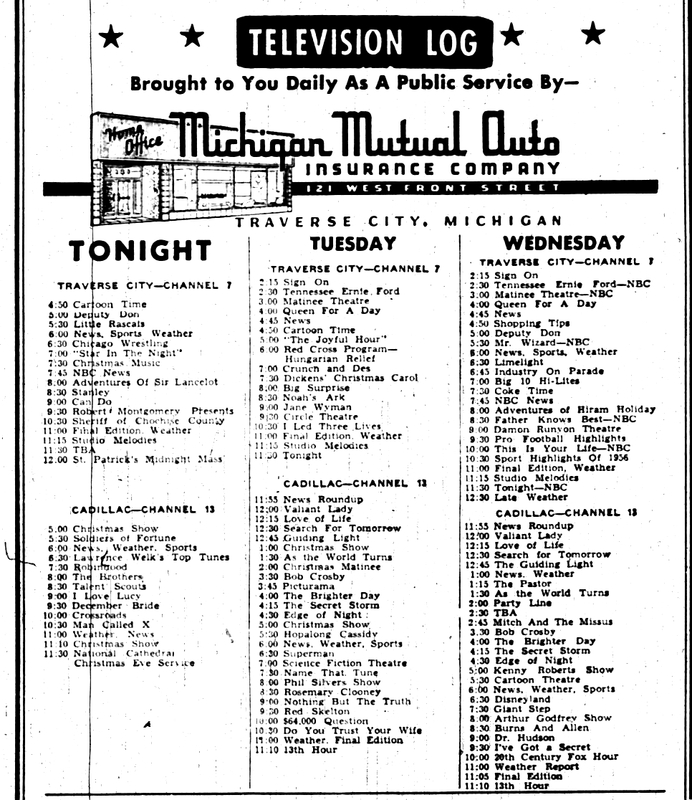 A thorough look through the index of the Traverse City newspapers, available at the reference department at the TADL Woodmere Branch, and online thanks to Osterlin Library at Northwestern Michigan College, reveals that, indeed, weather phenomena has always captured our attention. Each article on “Storm Cripples Region,” and “Lightning and Hail Does Damage,” always make the front page. Of course, not only did freak storms provide the locals with something to gab about; many people’s livelihoods depended day-to-day on the land and seas. A true disaster could spell economic doom for the region; imagine if the crops were beaten down by hail, or an ice storm of any magnitude could prevent supply trains from making the trip up north and keep ships from docking. 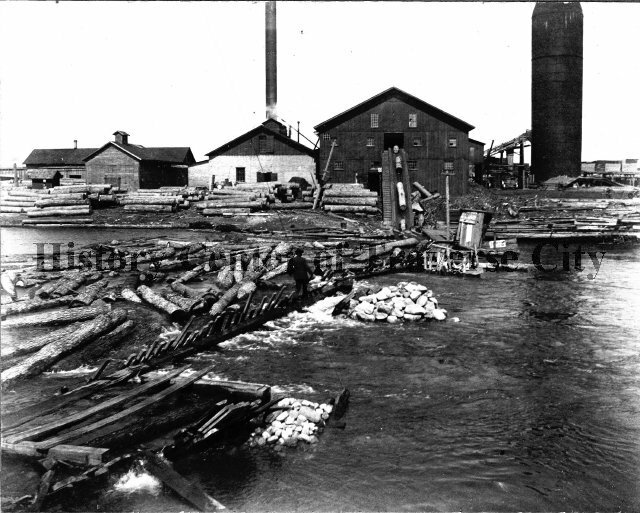 Hannah Lay sawmill on West Bay, undated. 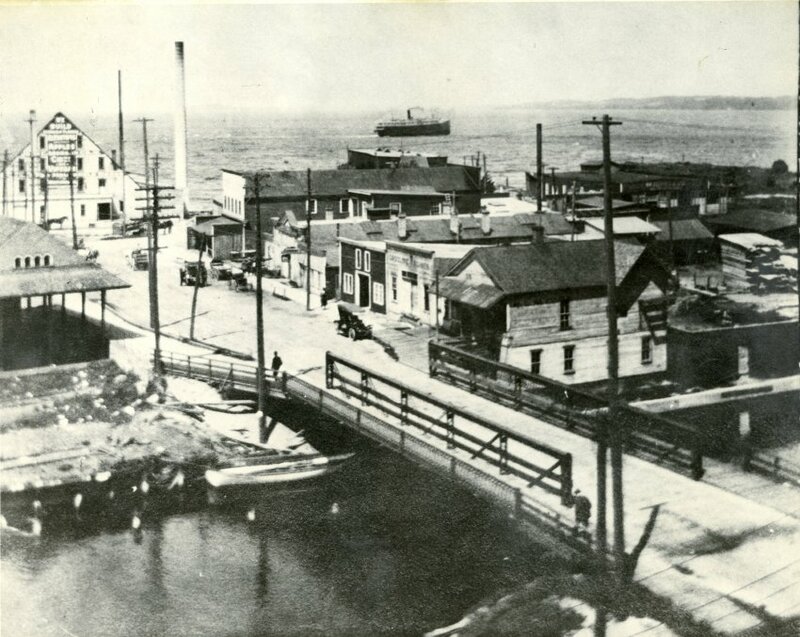 In 1905, West Bay was not the groomed property it is now, largely due to the industrial mills that occupied the waterfront at the turn of the last century. Image courtesy of History Center of Traverse City. The article goes on to describe tattered awnings throughout the city, broken windows, damaged roofs, fallen trees, dismantled schooners; in short, a scene of devastation. Despite our recent history and the wind storm of 1905, it seems that snow and ice storms would have been feared to a great degree, if for no other reason than their frequency. Of the storms that made the news between 1865 and 1927, 9 were of snow or ice; 5 were floods; 3 (give or take) were general storms, sometimes with hail. Snow and Sleet Work Havoc With Electric Light, Power And Telephone Wires. Night of Total Darkness Followed By Great Haste To Repair Damage Today — No Hope For Relief Until Night. Traverse City today is recovering from the most damaging storm in history. After a night of darkness and dread, business finds itself at a virtual standstill, with electrical current for power and lighting cut off, and telephone service demoralized. The snow and sleet of yesterday was responsible. In the early day, heavily laden wires began to snap. By night, thousands of wires were down. For the most part, they were telephone wires, but in dropping on power wires, they disabled the latter, until, at six o’clock, conditions were so serious that both electric companies were ordered to completely disconnect their power… The fire department had its hands full yesterday afternoon and last night responding to fire alarms and taking care of fallen wires. Again people are cautioned to be careful around wires, and to handle no wires they find in the streets or alleys. Men working on putting up the first telephone lines in the region, ca. 1898, the work of Citizens Telephone Co. 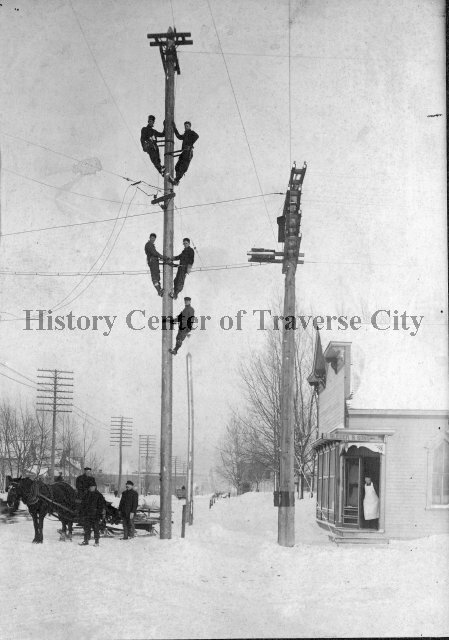 Image courtesy of the History Center of Traverse City. In the lightning and hail storm of September 16, 1920, The Citizens Telephone Company reported over 200 telephones out of work, and all toll lines (used exclusively for long-distance calls) out of commission; same with Bell Telephone. This report on the phone lines warranted a full paragraph of explanation, but agriculture was limited to one sentence at the tail end of the article. Reporting seemed disproportionate to the effect on citizens, as agricultural interests constituted the livelihood of many more people in the region than, say, the filing cabinet that lightning struck in the Johnson-Randall Company office, burning a hole through it. What have we gleaned from these reports of years past? That overtime, communications to the outside world began to take a precedence over immediate survival, as presumably the Grand Traverse Region could stand on its own without frequent supply trains. We can also guess that, in spite of this shift in attention, the disruptive nature of freak storms captured our interest in equal measure then as it does now. Amy Barritt is co-editor of Grand Traverse Journal. 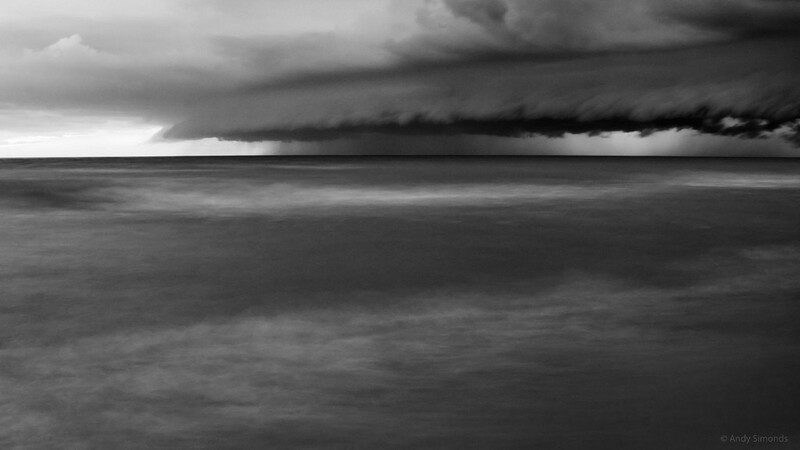 Header image courtesy of Andy Simonds, “Wall Cloud- Lake Michigan,” taken 6 August 2008. As a fumbling collector of automobile-related relics, I had long wondered why I couldn’t get road maps before the 1930’s. It took some time for me to understand that the folded maps offered free by the oil companies—Gulf, Shell, and Mobil—didn’t come out until the thirties. Before that time, I wondered, how did motorists navigate the highways in the first three decades of automobile travel? My discovery of the Automobile Blue Book answered the question. 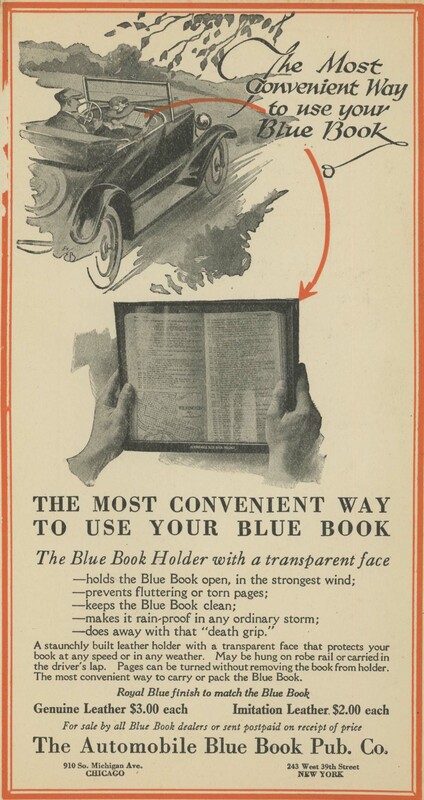 Not to be confused with the Blue Book that gives the cash value of automobiles, the Automobile Blue Book was a navigational aid to motorists at the dawn of the automobile age. 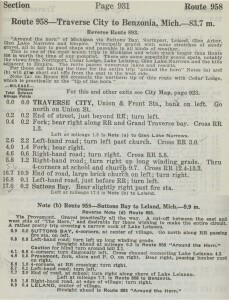 Through primitive maps and step-by-step written directions, it outlined routes from one destination to another, Traverse City to Benzonia, for example, or Traverse City to Old Mission. 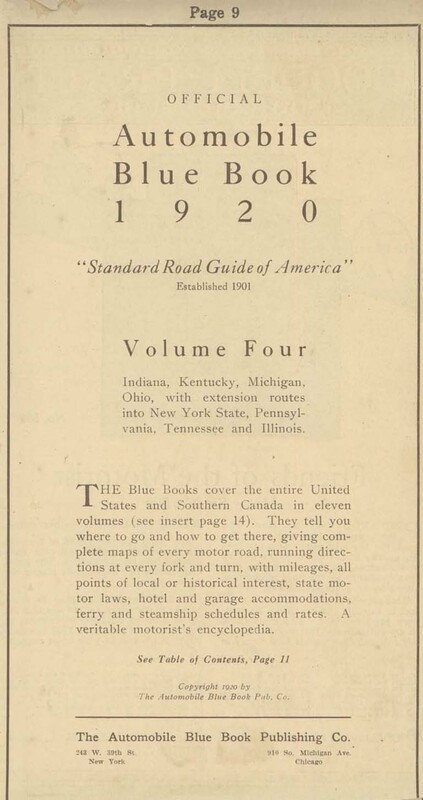 Blue Books contained much more than directions about how to get from one place to another: They offered information about roads (dirt, gravel, crushed stone), steep grades, and blind curves, and recommended the best and safest routes to drivers and navigators. Along some roads they cautioned travelers about boulders and washed-out places. With the unreliable machines of the time, information about garages and hotels was included within the directions: A breakdown requiring repairs and an overnight stay could occur anywhere. Successful auto trips required two partners—the driver and the navigator–since the driver cannot take time to keep looking at the book and the mileage while avoiding oncoming traffic, cattle blocking the highway, or ditches that loomed on either side of the road. 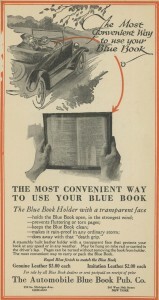 An advertisement for a celluloid protector for the Blue Book showed a man in the driver’s seat with his spouse alongside, patiently (we would presume) giving instructions to her husband. Of course, women drivers were not unknown in the twenties either, and roles could be reversed. At first, most cars lacked odometers altogether; they had to be purchased as an accessory. 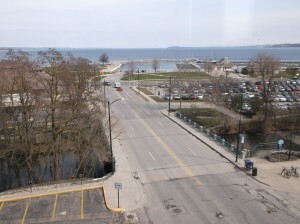 A starting point from each city center was designated—in Traverse City the junction of Union Street and Front served for all routes. Mileage was zeroed out at that point, all subsequent turns and landmarks measured in tenths of a mile. Like a modern GPS system, the navigator informed the driver of the route ahead, turns and distances, presumably in a calm voice that did not betoken a lack of confidence in the driver. Grand Traverse peninsula [sic] extends 18 miles into Grand Traverse bay and varies from one to three miles in width and in height from bay level to several hundred feet. With its rugged shore line, many promontories, sandy beaches and sheltered bays, it is the most beautiful region in southern Michigan. One can imagine travelers from remote places reading the Blue Book to educate themselves about the places they passed through. It was far more than a navigational aid: it was a book full of answers, much as our internet toys are now. 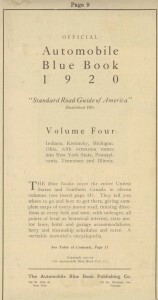 Upon receiving my Blue Book via an internet sale, I resolved to set out on a journey to catch the flavor of auto travel in the 1920s. Of course, it wouldn’t be the same: my Honda with its climate control system, stereo radio, comfortable seats, and relatively noiseless and dust-free operation would not capture the same sense of adventure (which, no doubt, was associated with the likelihood of misadventure) that motorists felt so long ago. I would not have to stop to fix flats as auto travelers frequently did in that era, in part because horseshoe nails no longer littered the roads. Highways and byways would be paved and smooth without the hazards of poor design, hasty construction, and the absence of highway warning signs (which hadn’t been standardized yet). In case of an accident I count on four air bags deploying at once while a Model T lacked seat belts and the advantage of a cabin protected by a cocoon of metal that can withstand crashes at 40 miles per hour. Perhaps all of that safety gear was not necessary given that the speed limit in Michigan and practically anywhere else in the country was slower than a horse’s gallop, 25 miles per hour. One of my Backspacer friends (the Backspacers are a tiny group of persons interested in local history), Marly Hanson, agreed to act as navigator during our journey. Possessing the preciseness of mind and the devotion to detail of a former reference librarian at the Traverse Area District Library, she was well suited for the job. While we were never in danger of getting lost, we would often have to make sense out of outdated instructions. After some consideration, we decided to go to Leland by way of Suttons Bay and Lake Leelanau, a short jaunt that could be done in a couple of hours or so. And so, with Blue Book in hand one early September day, we set out on our adventure. We zeroed out the odometer at the corner of Front and Union in front of the 5/3 bank, already feeling a sense of connectedness to our history since a bank had stood there in 1920, the Traverse City State Bank, founded by Perry Hannah, one of the founders of our town. However, we quickly realized that the Grandview Parkway did not exist at that time, an extended Bay Street carrying the traffic towards Leelanau county. Still, odometer readings were in fairly good agreement with the book as we crossed imaginary railroad tracks—now the TART trail—as we passed 72 which led up the long hill to the west of town. At 2.6 miles we were told to turn left, onto what is now Cherry Bend road, and this we did. A church was at the corner as indeed it was the West Bay Covenant Church. We expected to turn away from the bay here since the road from Traverse City did not proceed directly to Suttons Bay as it does now. It went inland and rode the ridge high up from the water. At approximately 9.7 miles we passed through a 4-corners with school and church—now Bingham–those buildings having been converted to the township hall and to a residence respectively. It was a straight sail to the end of the road and a large brick church, St. Michaels, in Suttons Bay. The trip had been easy so far, the roads no longer gravel but paved and straight for the most part. Old maples lined the highway, still standing after having been planted by local farmers ninety or more years ago. They were showing signs of age, premature aging, perhaps, due to the salt applied in winter. Pages 931 and 932 of the Blue Book, detailing trip author took. The entrance to Suttons Bay was different from now, the old road joining up with the modern one before the fire station which still stands, though now converted to a restaurant. Resisting an urge to spend time in the village, we proceeded out of town, up a “long, winding grade”—surely a staggering job for the engine of a Model T laboring to bring the car through gravel on a hot summer’s day. Reaching the top, we settled down for the long descending trek towards Lake Leelanau, that name being “Provemont” in 1920. Before we crossed the channel, we read a cryptic note: “4-corners; turn diagonally left. Cross channel connecting Lake Leelanau 4.3” The 4-corners still remains, but there is no possibility of a diagonal left turn: the bridge extends straight-ahead. Leaving town, we see that Main Street crosses our highway: Could it be that the bridge had been moved to the north, separating “Main Street” from the passage across the narrows? We would learn more on our return. Leland at last! We turned right, away from the waterfront to the center of the village, presumably a plot of land where the courthouse stood. Fairly recently that institution has been moved outside the village to a location along the road we had just traveled. Forlorn as if awaiting its possible demise, an old brick building with barred windows stood in a mowed field–the county jail–a vestige of the rule of law in this place. The center of town has moved from here to the busy commercial strip along M-22 and in Fishtown. We got in the car and returned to Lake Leelanau, eager to see if evidence of the old bridge can still be found. We passed the school and wound down a moderately steep hill to a dock that extended into the narrows. Walking out on it and looking down into the water, we saw slabs of concrete, surely relics of the 1920 crossing. The road on the other side would have had to bend diagonally to meet the bridge as the directions declared. Upon reaching the west bank, Main Street would have carried traffic through the tiny town: only a store and post office were mentioned as landmarks to look for. 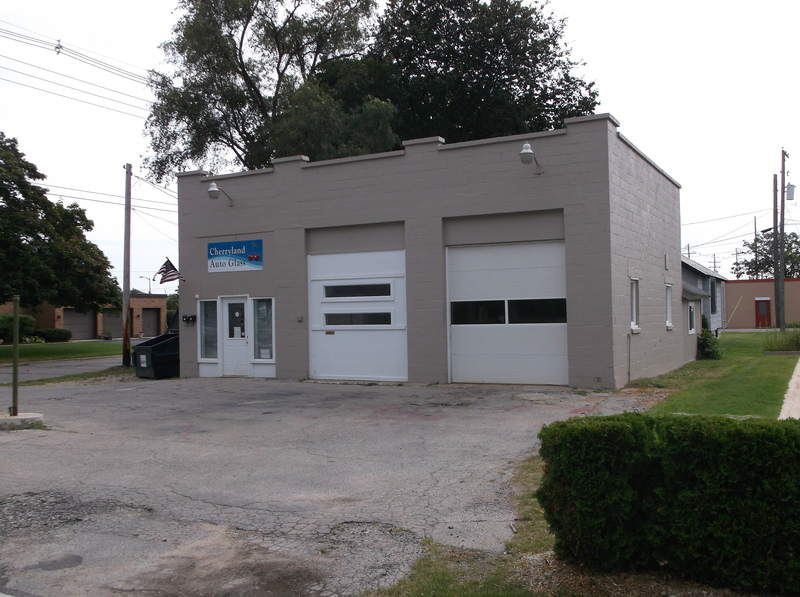 The post office is now gone, having been moved across the highway to St. Joseph Street, though a small frame building looking old enough to serve as “the store” remains. 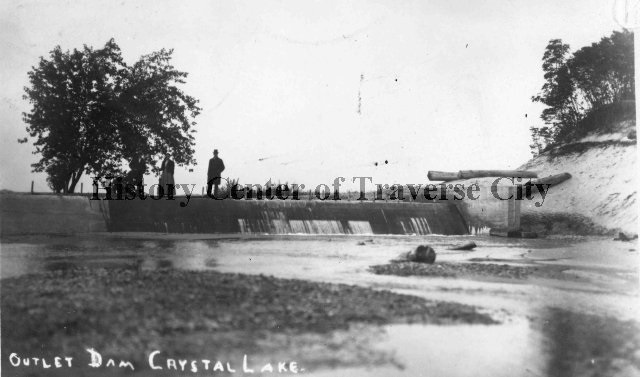 Provemont—Lake Leelanau—was not a major stop for travelers in 1920 or in 2014. So it was that we completed our day of travel following directions given in our Blue Book. Without need of wiping the dust from our faces or the perspiration from our brows, we returned to Traverse City the direct way, along the Bay. Our journey was without the romance of early automobile travel, but still provided the smallest glimpse into how motoring used to be. We decided we would plan another Blue Book guided trek to a new destination in coming weeks. Who knows what relics of history will be illuminated in that adventure? Note: Readers may visit the Woodmere branch of the library to inspect this Blue Book in the Nelson Room. Pages may be photocopied for those wishing to plan an expedition using Blue Book instructions. Happy motoring! 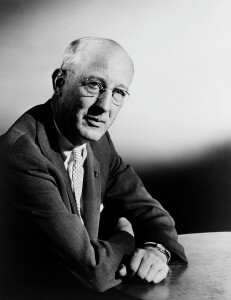 Bruce Catton, the Pulitzer Prize-winning author born and raised in Benzonia, graduated from the Benzonia Academy in 1916. Nearly one-hundred years later, students from the Frankfort High School class of 2016 have written essays about their experiences and observations, in the style of Catton. Their essays will be read aloud in dramatic fashion at the Mills Community House, Benzonia, on April 8th at 7:30pm. The best essay will win the 9th annual Bruce Catton Historical Awards, coordinated by Kay Bos. Bruce Catton’s Presidential Medal of Freedom Award, on display at the Mills Community House. Photograph courtesy of the author. 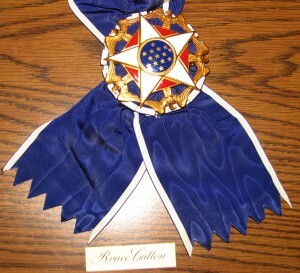 The Pulitzer Prize that Bruce Catton won is on display at the Benzie Area Historical Museum, across the street from the Mills Community House on the hill in Benzonia where Catton grew up. The Presidential Medal of Freedom that was given to him by Gerald Ford is also displayed there. But most important are the copies of his book, “Waiting for the Morning Train,” that are in the library for students to read. “Waiting for the Morning Train” is Catton’s memoir about growing up in Benzie County. It was written after he had served as a war correspondent in WWI and written books on the Civil War. Catton’s book, “A Stillness at Appomattox,” won the Pulitzer and has been widely read by people all over the world. It helped our Nation come to grips with the bloody Civil War. There is no one waiting at the train station in downtown Beulah at the moment. It has been over 50 years since The Frankfort and Southeastern Railroad has passed by, let alone stopped to pick up a passenger. Catton describes in “Waiting,” that the Catton Family rode the Pere Marquette Railroad to the depot in Thompsonville. From there they could change to the Chicago and West Michigan or the Ann Arbor . Riding the “Ping Pong” to Frankfort, the Cattons could board ferryboats to points West such as Manitowoc, Wisconsin. In all, a much slower-paced traveling experience than we have today. Bruce Catton, ca. 1960s. Image courtesy of Library of Congress. Catton’s writing gives powerful images of life in Northern Michigan a century ago. While describing the idyllic life in Benzonia he shows how life and the land have changed. One big change was the arrival of the first car that drove up and stopped at a baseball game in Beulah. All the baseball players stopped to watch the car. Concerning the land, fewer industries had an impact on Benzie County like the lumber industry. The sawdust from the mills covered the streams and smothered the fish spawning grounds. In “Waiting,” Catton wrote, “Despite his disclaimers, Man stands at the center of the Universe. It was made for him to use and the best and wisest are those who use it most. They destroy pine forests, dig copper mines and run open pits, impoverishing themselves at the same time they are enriching themselves: creating wealth, in short, by the act of destruction”. Dave Jackson, teacher, and his model Ignatius, with history students of Frankfort High School. Year-long preparation for the Catton Awards can be exhausting, but Ignatius is always present to provide encouragement. Photograph courtesy of the author. American History teacher Dave Jackson and English teacher Rebecca Hubbard have taught about Bruce Catton and his place in the cannon of American Writers. Frankfort Juniors are urged to write about their experiences in Benzie County, and luckily are able to follow in Catton’s footsteps, both literally and literarily. The Betsie and Platte Rivers flow near the student’s houses. The points at which the rivers meet Lake Michigan are places the students gather. Catton changed our Nation with his writing and so can students in the class of 2016. 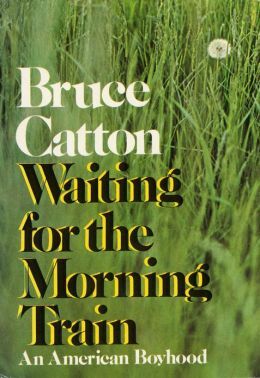 The youthful experiences of Bruce Catton informed his later writing, and we can all benefit from his insights on Nature and War. Youths growing up in Northern Michigan today can view the world through the Benzie prism as Bruce Catton once did. Frankfort student Casey Aldrich wrote about her adventure to the Clay pits and a stop at Franny’s Follies, and her classmate Bret Zimmerman left shore to troll the deep waters of Lake Michigan and returned with ten salmon over twenty pounds. Stewart Allison McFerran has a degree in Environmental Studies and worked with Frankfort students on a robotics project. He led an Antioch College environmental field program to the Great Lakes and worked as a naturalist at Innisfree. He worked as a deck hand for Lang Fisheries and currently is an instructor at NMC Extended Education program. He lives on a Benzie stream. He did graduate studies in science education and was a Research Associate at the Lawrence Berkeley Laboratory. He grew up on a Lake in Michigan where he caught and released many turtles from his rowboat “Mighty Mouse”. This is McFerran’s first contribution to Grand Traverse Journal.